Some of it comes from having such a wildly divergent perspective than seems perfectly logical and internally consistent but doesn't really fit with the outside world. This can make things really difficult when those concepts are invalidated. Knowing deep down that you're an outsider and being reminded of that in a 'safe' place can be hard. On the leaving the party early, some social situations can be really rough. The constant feeling of not belonging, the sharp even painful stimuli and trying to relate to other people can be exhausting. Sometimes its easier to run away than continue being there and being drained. Anyway, not that I would know anything about that. hah- I used to wonder what was going on when I got exhausted at parties, fell asleep in my chair, and periodically wandered into empty kitchens instead of hanging out. Then I read up on introversion, and it was like a flashbulb went off in my head- i discovered that there was actually REAL STUFF associated with it, not just "you aren't outgoing". I'm an introvert myself, so I do understand the pain and exhaustion of social situations. That's why I left the party early myself. Hell, I only knew two people there: Andy and the friend leaving for Thailand. But, I've been in dozens of situations where Andy and I were surrounded by strangers, and I was ready to go before Andy, or I left before Andy (depending on whether we carpooled or not). So I know, sometimes Andy can work through it. There's also the fact that he and I shared an apartment for several years in the late 90s-early 00s when he was trying to get back on his financial feet after his dad died. I really feel that, after being friends for decades I really ought to know him (and him me) better. Fears his own Power: Hyperion is tremendously physically powerful. He's afraid of using his full might for fear of harming someone. Motivation: Doing Good: The Miltons raised mark to use his tremendous powers for good. Weakness: Argonite: There is a radioactive isotope called Argonite that is one of Hype's chief vulnerabilities. His Toughness is not Impervious vs Argonite weapons, and they gain +5 effect. Also, when exposed to sufficient quantities, he will slowly lose his powers. Background An orphan raised by the Miltons, he is Hyperion, with powers and abilities far beyond those of mortal men; and, who, as Mark Milton, works for a great Cosmopolitan newspaper, fights a never-ending battle for truth, justice, and the American way. Hyperion was the first of Marvel's Supermanalogue's I ever encountered. It was actually in an ad in the back a friend's comic book, and it was an advertisement for the then soon-to-be-released "Squadron Supreme" maxi-series written by Mark Gruenwald. And, as I looked at the silouetted figures of the Squadron, I was like, "they can't do this". And so Andy dug out his copy of the S-issue of OHOTMU (first, and at the time, still only, edition), and there was a pastiche of the Justice League, complete with Rocket Central playing stand-in to the Justice League Satellite. Anyway, this build is built specifically on the version of Hyperion from the first two thirds of that series. The version who is afraid to use his powers against people, and states specifically that he has little actual combat experience. In the first issue, for example, Rocket Central is stated to have a mass of 367 tons, and Hyperion says it weighs about three times more than he can lift. 347/3 = 116 tons. Call it a 12 STR, and the rest is Hype's approximation errors. By keeping him a relatively mediocre combatant, he ends up being only a Power Level 9 character (where most of the Squadron were probably 7s or 8s). However, there is the whole business with him eventually killing his evil dopplegange in the 8th issue, and then him going blind from that battle. And it dawned on me that Hyperion has the Holding Back advantage. When he cuts loose, bad things happen: he fights off the control of the Overmind, he smashes up Rocket Central causing it to fall out of orbit, he cuts loose with the full power of his Atomic Vision, and, he goes blind. So I built "typical Hype" and "unheld back Hype" as a little thought experiment. Last edited by Ken on Thu Jun 22, 2017 6:22 pm, edited 3 times in total. Neat! I was thinking of re-posting the Squadron Supreme cast (I was hesitating on doing in back on RA, and it was irking me how 90% of my archives were completely RA, while all the Squadron cast were sitting there with ATT links). And yeah, it's funny how sincere Gruenwald was in trying to keep to "Class 100" basics, by having guys outright state their strength levels so that it was canon that even someone like HYPERION could only lift one-hundred tons or so. Nowadays, guys are routinely lifting multiple times that. Hype was way out of scale to the rest of his team, too- Nighthawk wanted to kill Hyperion in the first issue solely because Hype's death would prevent the Squadron having the capability to enact any of their plans. And his inexperience with real, serious combat led to him being handled effectively by the giant Redstone. Gruenwald was the editor and main writer on the first few editions of the OHOTMU (that's Official Handbook of the Marvel Universe if anyone doesn't know the acronym), and I suspect that he was trying to get other writers to follow it too. What's weird is that in the Deluxe Edition, while the Sqadron got more coverage, and the details of the Limited Series were achknowledged, the actual powers were toned down from what was said in the actual series, despite Gruenwald's involvment. For instance, Hype's strength, which was 100 or so tons in the series and his doppleganger was 90 tons in the first OHOTMU, both were down to 75 tons in the Deluxe OHOTMU. At one point, early in issue #8, I believe, it is stated that Stan Stewart considered calling himself the Boomer because he could run fast enough to break the sound barrier. Near sea level that's around 760 mph. Deluxe Edition of Ohotmu? 175 mph. Which make sme think that Shooter or someone was insisting on changes in OHOTMU. I was terribly amused when OHOTMU stated specifically that Golden Archer was the Squadron's first recruit (after the first seven: Hyperin Nighthawk, Amphibian, Power Princess, Whizzer, Dr. Spectrum, and the Skrullian Skymaster), Tom Thumb was the second, Cap'n Hawk/Blue Eagle the third, and Lady Lark the 4th. But, then again, I have some of Gruenwald's first published-in-comics work in the letter pages of some old issues of Justice Leagueof America, so. Actually, the Skrullian Skymaster was called that in the Squadron Supreme series but was simply "the Skrull" in OHOTMU. Go figure. 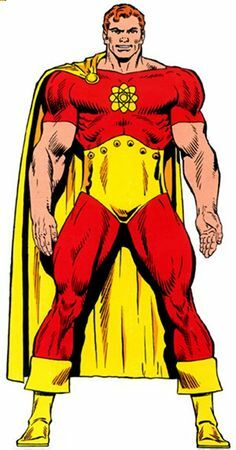 I was more amused what when in Squadron Supreme: New World Order when they revealed that he was "Skymax, the Skrullian Skymaster" and that he was, essentially, Other-Earth's (Earth-712's) "Super Skrull". I can shed a little light on the various Hyperion strength levels (I think), as well as the OHOTMU strength chart. When Mark Gruenwald made the strength chart, he did mean for it to be the definitive measure of the character at that moment. Subject to change if change occurs within a comic and then spotlighted in the next MU edition. Mark did mean for "100 tons" to mean just that. Albeit, way too low for even back in 1982, it was a starting point to quantify characters.it did need work and further enhancement, something like what the old Marvel Superheroes FASERIP system did. Although most super-strong characters in he RPG were still kept at only "Unearthly" or 100 tons (really 88-125), and not expanded upon like 150 (Shift X) and so on. After Mark's passing, someone at Marvel needed to have that same insight, step up and expand the levels to higher and more authentic ranges. But no one ever did. Thus, today, we still have Mark's "100-Ton" range. For Hyperion's fluctuating strengths, it was stated that it was based on what was shown in the comics. Same thing for Doc Samson. However, in Hyperion's case, it turned out that there are multiple Hyperion's and so the different strengths vary with each individual. While most Hyperion's were weaker than Thor, they could give him a hard time. The problem there is that I'm talking about the '85-'86 mini-series and the '93 OHOTMU and the '87-'88 Deluxe OHOTMU only. At that point there had only been two Hyperions. The Earth-712 Hyperion and the Earth-616 Hyperion (who had died in issue 8 of SS). And the numbers the Deluxe OHOTMU do not match what Gru explicitly put into the SS limited series. Right, but all those later editions were based off of Mark's original version, which I referenced. Unfortunately, Mark is no longer here for us to ask ( ), but I was stating what I heard Mark and others say in interviews. I thought I was adding info and insight based on what the Marvel staff of the day had to say. Sorry if that did not help. Whitebread: Black Vulcan, despite his name, is no more urban or "street" than his colleagues. 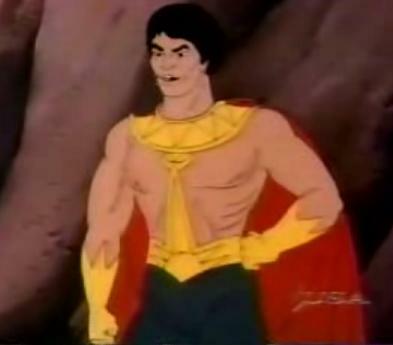 In some ways, Black Vulcan was the most egrigous of the Hannah-Barbera added Superfriends. At the time of his introduction, Black Lightning was DC's hot new character. And, Tony Isabella had it in his contract that if Black Lightning was used in other media, he'd get a cut. No one wanted to pay out that money. So... Black Vulcan, the more powerful, less ghetto elctric-hero-of-colour was created. He had two costumes. The first one, which was cool but only used in two appearances, and a second one that showed off his legs. I assume this was done to show off his non-whiteness. Angel in his Voice Box: Samurai speaks in a very clipped manner, presumably to avoid sounding like Hawkman or Flash. I din't include Samurai's flame or illusion powers. I believe he power stunted those. Unrequited Feelings: Apache Chief's feelings for Wonder Woman were evicent from co-opting one of her foes and teaming with her whenever possible. 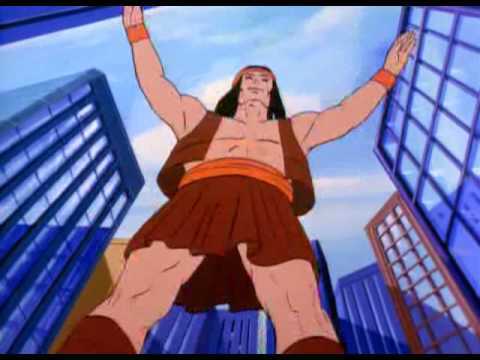 In his early appearances, the narrator said Apache Chief grew to be 50 ft. tall. The animators weren't so careful. In the opening sequences some years we saw him standing at skyscraper height or tall enough to hold up both ends of a train trestle. Last edited by Ken on Thu Jun 22, 2017 6:05 pm, edited 1 time in total. Quirk: Broken English: El Dorado is unable to speak English without interjecting some basic Spanish words into it. I included his flight because the year they introduced Firestorm, the opening sequence clearly showed El Dorado flying. In the episodes, I don't know that he ever did. Apache Chief generally grew to around 50 feet tall, but he'd been demonstrated to keep up with the alien Colossus when they both expanded in size until they were each standing on a continent and wrestling each other across the Atlantic.